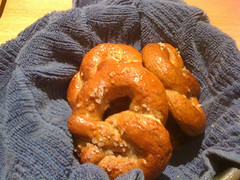 On Monday, my friend Laura sent me a recipe for Rye Pretzels she saw on NYTimes.com, and I knew immediately that I wanted to try it out — I even had all the ingredients on hand! It took me a whole two days to get around to it, and I’m glad I decided to try this one sooner rather than later. Making pretzels reminded me a bit of making bagels, since there was rolling and shaping involved, as well as boiling before baking. It all went surprisingly smoothly, too. I was worried at first since the dough seemed like it might be a bit dry, but after it rose, it was soft — and it got huge! 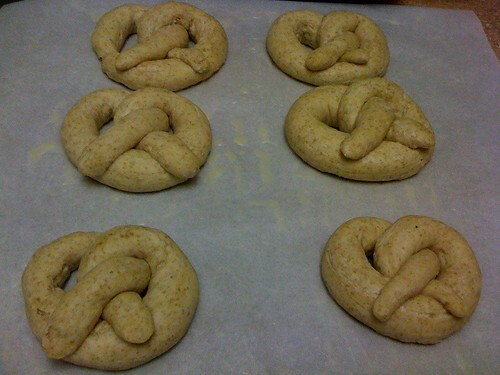 When it was time to start rolling out the pretzel shapes, the dough was really easy to handle, and the pretzels came together really quickly and nicely. Once they were shaped, I boiled them in water with baking soda in it, and let them dry a bit on a towel before sprinkling them with sea salt and putting them in the oven. The rye flour gave them a beautiful dark brown color, and I drizzled on a little butter once they came out of the over to make them glossy and give them some extra flavor. And boy, did these pretzels have flavor! 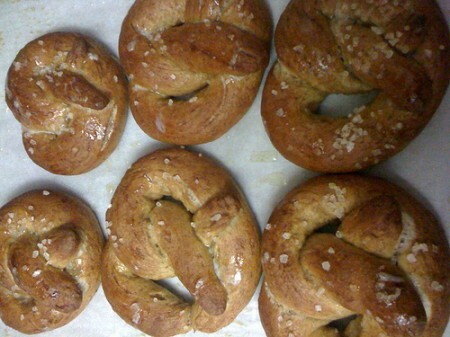 Between the rye, honey, sea salt and butter, they were unlike any other pretzels I had, yet still had that wonderful slightly chewy texture and nice thin crust. I ate one almost right out of the oven and brought the rest to Evan’s office for everyone working late. Special Pretzel Delivery! They were still warm when I got there. I’ve always been a fan of soft pretzels, but these were far and beyond any soft pretzel I’d ever had at the mall or at a football game. I love making things like this that are really a special treat and something you can’t get on a regular basis. Next time I’ll roll the dough out a little thinner so the holes in the pretzel are bigger — I underestimated just how much they would continue to rise. Want to try this for yourself? Check out the recipe at NYTimes.com.